There are mystery, murder, thriller in this story. There is some strange relationship. And there with its an intellectual game of detective Bomkesh Bakshi. 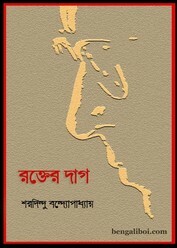 This fictional detective character created by Sharadindu Bandyopadhyay. The young man gave a bundle of money to Bomkesh and said, "If I suddenly die, you will find out the cause of death". After a few days the young man was really murdered. To know the story of murder, just download the book as pdf, Epub or Mobi format.